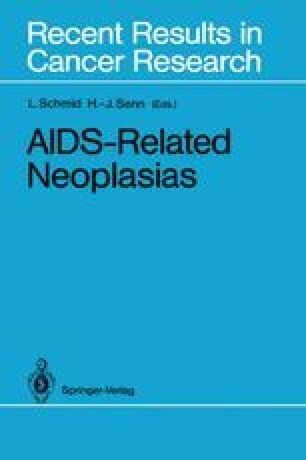 Many of the immunological mechanisms associated with the development and pathogenesis of AIDS are now well understood . Thus, T-cell activation and proliferation facilitate HIV infection and virus proliferation. Macrophages, B cells, endothelial cells, and brain cells may also become infected. T-cell depletion resulting from lysis, syncytium formation, and anti-T-cell autoantibody is the fundamental immunological defect. Neutralizing antibody to virus-membrane antigens may play an important role in prognosis. Pathogenesis is related, in part, to the activity of cofactors such as Epstein-Barr virus EBV and cytomegalovirus CMV infection. Immunological mechanisms in HIV infection are summarized in Fig. 1. Chronic active infections in intravenous drug abusers and homosexuals are important contributing factors. This can itself result in immunodeficiency, which has been demonstrated in EBV, CMV, herpes simplex virus (HSV), and hepatitis B infections. It can also result in chronic antigenic stimulation and immune activation. The latter can also be seen in hemophiliacs, secondary to chronic blood product administration. Surgically induced stress followed by transfusion of HIV-contaminated blood is also important. The immune activation and immune deficiency produced by the above allow for facilitation of the HIV infection.